Aqeela Asifi is the 2015 winner of UNHCR’s Nansen Refugee Award, recognized for her indefatigable efforts to help refugee girls access education. UNHCR honors an Afghan refugee for her indefatigable efforts to help girl refugees access education. Aqeela Asifi fled Afghanistan as a young woman. A 26-year-old teacher in Kabul, Asifi had already lived through revolution, invasion, and occupation when the civil war broke out in 1992. As rival mujahideen factions laid siege to Kabul, Asifi, her husband, and her two small children fled to Pakistan. She was one of more than three million Afghan refugees in Pakistan during the 1990s. Over 180,000 people lived in the refugee camp near Kot Chandana in southeastern Punjab province where Asifi and her family ended their flight from war. Asifi noticed the lack of education opportunities for children in the camps, particularly girls. After gaining the backing of village elders, Asifi one-by-one convinced refugee parents to allow her to tutor their children. After 23 years, Asifi’s school moved from the back of her brother-in-law’s tent to a formal tent-school to a permanent building. She shepherded more than 1,000 girls through the eighth grade, overcoming functional difficulties, cultural challenges, and bureaucratic roadblocks. Kot Chandana’s refugee population has shrunk to 13,400 as Afghans return to their country, among them young women who benefited from Asifi’s determination. Haseena, nine years old, left, and Nadia, twelve years old. 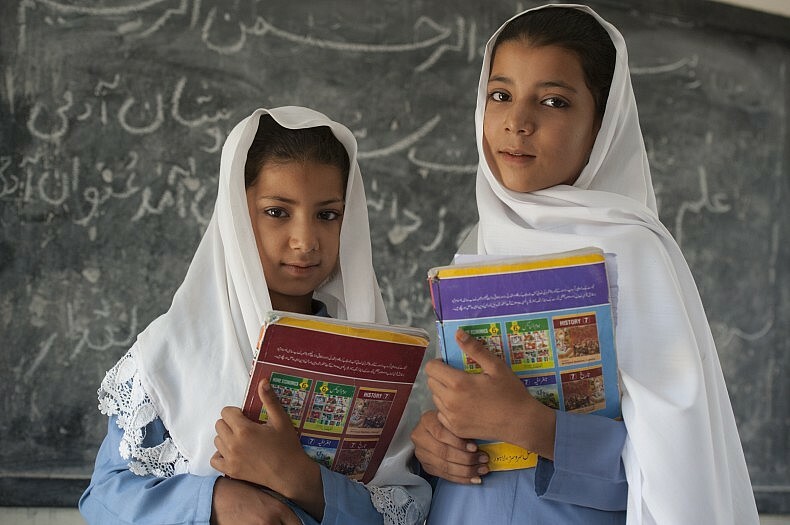 The sisters are the second generation of Afghan refugee girls to attend Asifi’s school. Their mother, Salma, was among the first girl students two decades ago. Moreover, young people returning to Afghanistan will play an important role in shaping the country’s future. Although millions of Afghans have returned to the country after the 2001 ousting of the Taliban regime, more than 3.7 million Afghans continue to live as refugees, many of them in neighboring Pakistan and Iran. Counting, caring for and repatriating millions of refugees is a herculean task, and as the Special Inspector General for Afghan Reconstruction (SIGAR) notes in a recent audit of U.S. funds directed toward refugee programs, it’s not only difficult to verify how many refugees live in Pakistan and Iran but those who return to Afghanistan still face difficulties. Corruption and lack of capacity in the Afghan Ministry of Refugees and Repatriation has meant that returnees may not get the help they need–those who are illiterate and uneducated don’t have as many opportunities either. Before the recent surge in violence in Syria and Iraq, which has generated more than 4 million refugees, UNHCR reported that Afghanistan was the world’s top producer of refugees for the 32nd year in a row last year. “Afghanistan is the largest, most protracted refugee crisis in the world,” the recent UNHCR report notes. Refugees are a serious humanitarian crisis and politically difficult issue throughout Asia–from Afghan refugees in Pakistan to the plight of Rohingya and other refugee groups in southeast Asia–but also, unfortunately, around the world. Afghan refugees can’t stay in Europe, but they face considerable uncertainty upon returning home. Afghanistan’s 32-Year Refugee CrisisThe Afghan Endgame: What, When, and HowThe Afghan National Unity Government’s ‘China Card’ Approach to Pakistan: Part 2The ‘Father of the Taliban’ Is Dead. What Does That Mean for the Afghan Peace Process?Imran Khan's Citizenship Offer to Afghan Refugees: A Promise or a Topic for Debate?